Flexible tool use is closely associated with higher mental processes such as the ability to plan actions. 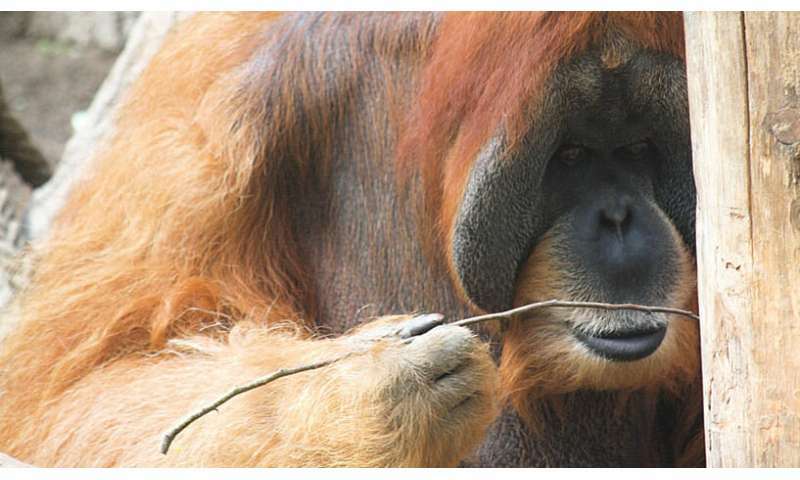 Now a group of cognitive biologists and comparative psychologists from the University of Vienna, the University of St Andrews and the University of Veterinary Medicine Vienna that included Isabelle Laumer and Josep Call, has studied tool related decision-making in a non-human primate species – the orangutan. They found that the apes carefully weighed their options: eat an immediately available food reward or wait and use a tool to obtain a better reward instead? To do so the apes considered the details such as differences in quality between the two food rewards and the functionality of the available tools in order to obtain a high quality food reward, even when multidimensional task components had to be assessed simultaneously. Tool-use in animals is a rare and often quickly rated as intelligent due to its striking nature. For instance, antlions throw small pebbles at potential prey, archer fish down prey by spitting water at them, and sea otters use stones to crack open shells. Nevertheless, most types of tool use are quite inflexible, typically applied to one situation and tightly controlled by processes that are a part of the respective animal's inborn behavioural repertoire. In contrast, intelligent tool use requires the integration of multiple sources of information to flexibly adapt to quickly changing environmental conditions. The researchers used two different types of food items: Banana-pellets, which are the orangutans' most favourite food type, and apple pieces which they like but disregard if banana-pellets are available. They could extract these items from two different apparatuses: an apparatus required probing with a stick tool to obtain the food item while the other required dropping a ball inside it. Each apparatus could only be operated with the respective tool. During testing, orangutans were confronted with either one or two baited apparatus/es and a choice between two items (usually a food item and a tool). Once the apes had picked one item the other was immediately removed. Orangutans flexibly adapted their decisions to different conditions: "If the apple piece (likeable food) or the banana-pellet (favourite food) was out of immediate reach inside the apparatus and the choice was between an immediate banana-pellet and a tool, they chose the food over the tool, even when the tool was functional for the respective apparatus", explains Isabelle Laumer who conducted the experiment. "However, when the orangutans could choose between the apple-piece and a tool they chose the tool but only if it worked for the available apparatus: For example when the stick and the likeable food was available but the apes faced the ball-apparatus baited with the favourite banana-pellet, they chose the apple-piece over the non-functional tool. However when the stick-apparatus with the banana-pellet inside was available they chose the stick-tool over the immediate apple-piece", she further explains. "In a final task, that required the orangutans to simultaneously focus on the two apparatuses, one baited with the banana-pellet and the other with the apple and the orangutans had to choose between the two tools they were still able to make profitable decisions by choosing the tool that enabled them to operate the apparatus with the favorite food." These results are similar to findings in Gofffin cockatoos that have been previously tested in the same task. "Similar to the apes, the cockatoos could overcome immediate impulses in favor of future gains even if this implied tool use. "The birds were confronted with the choice between a tool to retrieve an out-of-reach food item and an immediate reward. We found that they, similar to the apes, were highly sensible to the quality of the immediate relative to the out-of-reach reward at the same time as to whether the available tool would actually work with the task at hand", explains Alice Auersperg, the head of the Goffin Lab in Austria. She continues: "Again, this suggests that similar cognitive abilities can evolve independently in distantly related species. "Nevertheless, the cockatoos did reach their limit at the very last task in which both apparatuses baited with both possible food qualities and both tools were available at the same time." "Optimality models suggest that orangutans should flexibly adapt their foraging decisions depending on the availability of high nutritional food sources, such as fruits", says Josep Call from the University of St Andrews. "Our study shows that orangutans can simultaneously consider multi-dimensional task components in order to maximize their gains and it is very likely that we haven´t even reached the full extent of their information processing capabilities." 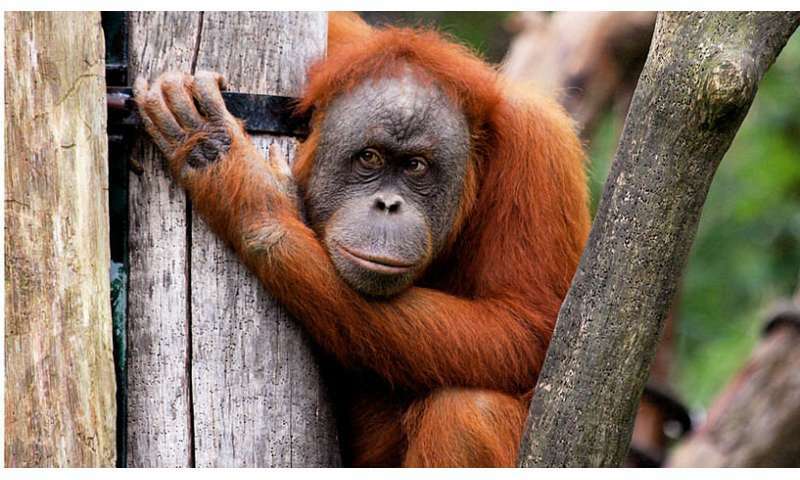 "According to a 2007 survey by the United Nations Environment Program (UNEP) orangutans will be extinct in the wild within two decades if current deforestation trends continue", says Isabelle Laumer. 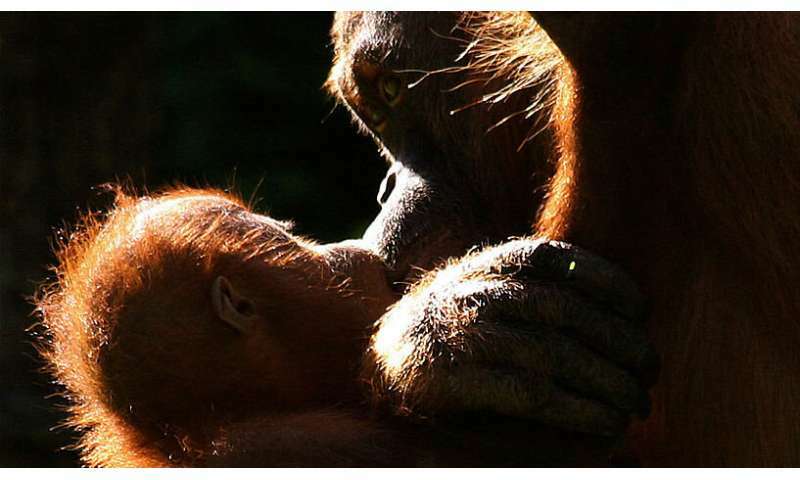 "Habitat loss due to extensive palm-oil production is the major threat. Unfortunately palm oil is still the most widely used vegetable oil in the world. As long as there is a demand for palm oil and we keep buying products that contain palm oil, more and more of the rain-forest will be destroyed. Each of us can positively impact the survival of these extraordinary animals by making purchase decisions that may appear small, but that can collectively make a huge impact on our planet."